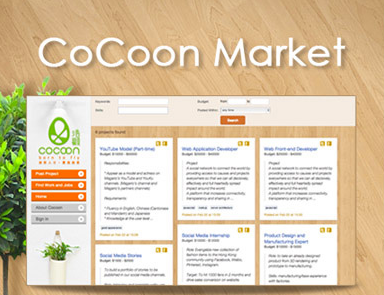 Welcome to CoCoon Market, a platform for entrepreneurs to post and apply for entrepreneurship projects. Here you will meet software engineers, designers, social media gurus and more. Are you looking to build an app, revamp a website, growth hack a product, re-imagine an idea, evangelize your service? ​Post your project on the CoCoon Market online platform. In the entrepreneurship ecosystem there is always interesting work.